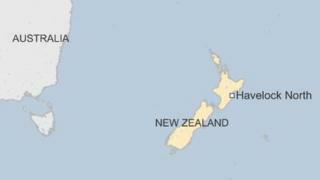 Two people are in a critical condition and hundreds more are ill after drinking tainted tap water in a small town in northern New Zealand. At least 18 people were hospitalised in Havelock North town, officials say. They tested positive for campylobacter bacteria, the most common cause of food poisoning. The bacteria is usually spread by animal faeces. Other residents have complained of gastroenteritis forcing local schools to close for two days. The council says the water is being treated but all residents should boil their tap water. Havelock North's mayor, Lawrence Yule, apologised for the incident on Radio New Zealand and said tests are currently under way to confirm what had contaminated the water. It is still unclear how the water in underground aquifers became tainted. The district council has been criticised for not calling schools, rest homes and other centres as soon as they knew there was a problem. Instead, they sent out a press release late on Friday, according to RNZ news. About 13,000 people live in Havelock North.